Stinging Nettles (Urtica dioica) is a perennial flowering plant that can grow up to seven feet tall in a summer and then die back to the ground in the winter. It is native to Europe, Asia and northern Africa; in North America it is found from Alaska to northern Mexico, in every province and state except Hawaii. Once you’ve encountered it, you will not forget it. The leaves of the nettle, which can be up to six inches long, have a serrated edge, but the most notable characteristic of the nettle are the “hairs” on the stem. 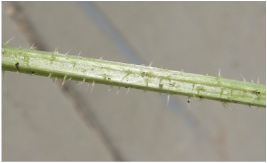 Five of the six subspecies of nettle have hollow hairs that act like tiny hypodermic needles, injecting several different chemicals including histamine and formic acid. Just brushing up against the plant is enough to incur a painful rash similar to poison ivy. Formic acid has a pH of 2-3 which is slightly a stronger acid than vinegar so one of the common remedies for a nettle sting is to apply a paste of baking soda to neutralize the acid. However, there are many different chemicals in the sting of a nettle; that may account for so many different treatments. Baking soda may calm the acidic burn, but not affect the histamine issue. A cream containing antihistamines might sooth the affect of the histamine but not the acidic burn. Other suggested remedies include liquid dish detergent or liquid hand soap, which are also alkaline like baking soda. Hydrocortisone cream, calamine lotion, Desitin diaper ointment may also give relief. Some people recommend rubbing alcohol. Aloe vera gel or the pulp of an aloe vera plant is an effective anti-inflammatory agent and provides immediate, if not lasting, pain relief. If you are camping and have limited resources another common treatment is to crush dock leaves because they contain an alkaline substance. 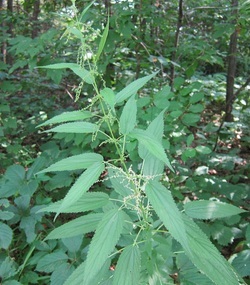 Fortunately, dock often grows with nettles so it may not quite as formidable a task to find dock leaves as it sounds. One of the most surprising suggested treatments is the nettle plant itself. Some people swear that carefully picking a leaf (avoiding the hairs on the stem) and chewing the leaf and spitting the pulp on the sting will bring immediate relief. I’m afraid I’d have to be pretty desperate to try this one. It’s not as if nettle leaves are inedible. Nettles, like many weeds, are quite nutritious and used not only as a vegetable but also as a medicinal herb. As a food source, nettles are high in iron, potassium, manganese, calcium and vitamins A and C and protein. As a medicinal herb them most common use of nettles is for hay fever or allergies. There are even people who purposely keep a patch of nettles and claim that by eating a raw leave they have relief from hay fever symptoms for several hours. Dr. Andrew Wiel, M.D. author of Natural Health/Natural Medicine says he knows of nothing more effective for allergy relief. Decongestants, antihistamines, allergy shots and even prescription medications treat only the symptoms of allergies and tend to lose effectiveness over a period of time. Nettles, unlike many medicines, do not have any side effects and can be used on a regular basis. Other health benefit claims include effective treatment of arthritis, anemia and an assortment of kidneys and urinary tract disorders such as kidney stones, prostate enlargement, bladder infections; nettle is also used as a diuretic. Some studies suggest the nettle might be useful treating Alzheimer's disease, asthma, bronchitis, bursitis, gingivitis, gout, hives, high blood pressure, kidney stones, laryngitis, multiple sclerosis, PMS, sciatica, excessive menstruation, and skin complaints such as eczema. Astringent properties of nettle aerial parts may also help to lessen the swelling of hemorrhoids and stop bleeding from minor skin injuries such as razor nicks. Nettle has been suggested as helpful with glycemic control in type 2 diabetes patients who need to use insulin. 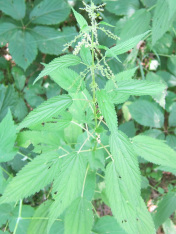 Some extracts of the nettle are used by bodybuilders in an effort to increase testosterone. Nettle is even used in shampoos to control dandruff and is said to make hair more lustrous. Many of these claims have not been proven but if even half of them were true it would seem that the nettle is a wonder plant. But wait -- there’s more! In the garden nettles are useful as a compost activator or made into a tea useful as a liquid fertilizer because of their high nitrogen content. You can even wear them. The German army made uniforms from nettle during World War I because of the shortage of cotton. There are clothing manufacturers in Europe who are again experimenting with nettle fabrics. Soaking stinging nettles in water or cooking will remove the stinging chemicals from the plant, which allows them to be handled and eaten safely. As with most weeds, they are said to be a substitute for spinach. The taste has been compared to asparagus, arugula and cucumber. The way to pick nettles is to wear long sleeves, long pants and thick gloves but even so, avoid grabbing the stems as much as possible. Although cooking is necessary to remove the stinging danger of nettles, there are those who choose to eat the fresh leaves for allergy or hay fever relief…or just for the thrill of it. Every year at the Bottle Inn, in Marshwood, Dorset, UK, there is a nettle eating championship. Contestants have one hour to strip the leaves from two foot segments of nettle stalks and eat as much as possible. After an hour the bare stalks are measured and the winner is the competitor with the greatest accumulated length of nettles. Winning lengths are generally in the 70-80 foot range. Experience nettle-eaters claim there is a learned skill involved in folding the leaf over as quickly as possible and pressing the hairs down to prevent being stung as much as possible but even experienced nettle eaters experience swollen and blackened tongues as they rush to eat more nettles than anyone else. I have to admit, even after all the terrific claims for nettles, I'm still hesitant about experimenting with them because of their stings, but I did pick some in case I get inspired (or brave). Most of the weed recipes are variations of soups, quiche-like dishes and spreads or pesto. The nettle is no different. Not surprisingly, many of the nettle recipes come from England. Following is an "American translation" of a recipe from Robin Harford (http://www.eatweeds.co.uk). Melt the butter over medium heat. Stir in the flour and cook for one minute. Remove from heat and slowly add the milk stirring constantly. Add the nettles and return the pan to the heat and simmer stirring continuously for about five minutes until thickened. Add remaining ingredients and cook another one to two minutes. In a large soup pot over medium heat, heat the olive oil. Peel and dice the carrot, onion and potato. Add the vegetables to the oil and cook for about 10 minutes -- until they start to soften. Add the chicken broth and bring to a boil. Reduce heat and simmer for 10 to 15 minutes, or until the vegetables are soft. Add the nettle leaves and simmer for about one minute to wilt. Remove from heat and allow to cool. When safe, blend in a blender until very smooth. Return to the pot and reheat, seasoning with the salt and pepper. Just before serving stir in the cream and heat through. To make the crust, place the flour in a large bowl. Whisk and cut in the olive oil with a fork until the mixture resembles coarse meal. Whisk in the water a little at a time, until the dough just begins to hold together. Form into a ball, wrap in plastic wrap, and let rest in the refrigerator for 20 minutes. Roll out the dough and place in a 9-inch pie pan; prick the bottom lightly with a fork. Place in the 400° oven and bake for 8 minutes, until crust is slightly golden. Remove from oven and set aside. Reduce the oven temperature to 350°. Meanwhile, make the filling. Bring a large pot of salted water to a boil and add the nettle leaves. Boil for three minutes. Drain and rinse with cold water. Drain again and set aside. When cool, chop the nettle tops into thin strips. Set aside. In a medium saucepan, heat the olive oil and add the green onions. Sauté for about four minutes, until soft. Beat the eggs. Add the the milk and cream, whisking to combine. Stir in the cooked nettles, salt, pepper, thyme and grated Swiss cheese. Pour the filling into the tart shell and sprinkle evenly with the grated Parmesan cheese. Bake at 350° for 30 to 40 minutes, until set and the surface is golden. Let cool slightly before serving. 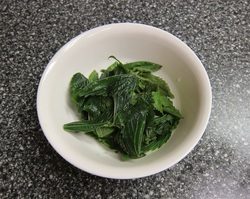 To cook the nettles, place leaves in a pot of salted, boiling water for about three minutes, drain well and chop. In a food processor, combine the nuts and garlic. Process to chop coarsely. Add about half the nettles and process to chop coarsely. Add the remaining nettles and olive oil and process until a thick green sauce forms. If the sauce is too thick, add a little more olive oil. Add the cheese and dash of lemon juice, and season with salt and pepper. Process briefly. Serve with pasta or spread on touted bread, pita bread or crackers. Pour the leftover into a glass jar or other container and top with a thin layer of olive oil to prevent the surface from discoloring. Cover tightly and refrigerate for up to 2 weeks. Love is like a dew that falls on both nettles and lilies.